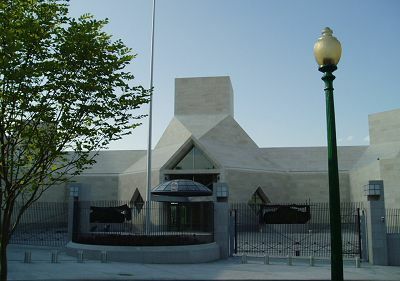 WASHINGTON -- A new Chinese embassy building was unveiled Tuesday night, a few days before a new US embassy building in China will be inaugurated. The building was officially inaugurated before an audience of about 500 people with visiting Chinese Foreign Minister Yang Jiechi, Chinese Ambassador to the US Zhou Wenzhong, Chinese American architect who designed the building, Bei Yuming (Leoh Ming Pei), and five US cabinet members cutting the ribbon. Yang congratulated on the opening of the new embassy and paid his high tribute to all that have helped with the project. "We are gathered here today to inaugurate the new chancery of the Chinese Embassy in the United States," he said. "This is a symbol of the important progress in China-US relations. It is an event that we should celebrate." Yang described the new chancery, which he said got the single largest investment among all Chinese diplomatic and consular missions abroad, "a perfect blend of Chinese and Western cultures" in a "stately and elegant style." "It adds to the beautiful landscape of Washington DC, and lends another jubilant note to China-US relations." Yang reviewed the history from China's first liaison office that was established in 1973 in a dozen of rented rooms of the Mayflower Hotel in Washington DC, to the current embassy building that was turned from a hotel in 1979, and expressed gratitude toward all the Chinese diplomats and staff who have worked throughout these years. "Along with 35 years of evolution of the Chinese Embassy, China-US relationship has gone through an extraordinary path and made major progress," he said. "It is fair to say that China-US relationship is now at an unprecedented level in its width, depth, and strategic significance." A new US embassy in China will be inaugurated on August 8 under watch of President George W. Bush, the same day of the opening of the Beijing Olympic Games. "The completion of the two new embassies not only reflects the good shape of our relationship, but also signals broad prospects for its further growth," Yang added.